If you've been following the drama unfolding in the early evening sky over the past week, you may have seen two brilliant luminaries, planets Venus and Jupiter, getting closer together, night by night. You have not been hallucinating, and we're not under attack by alien spacecraft! 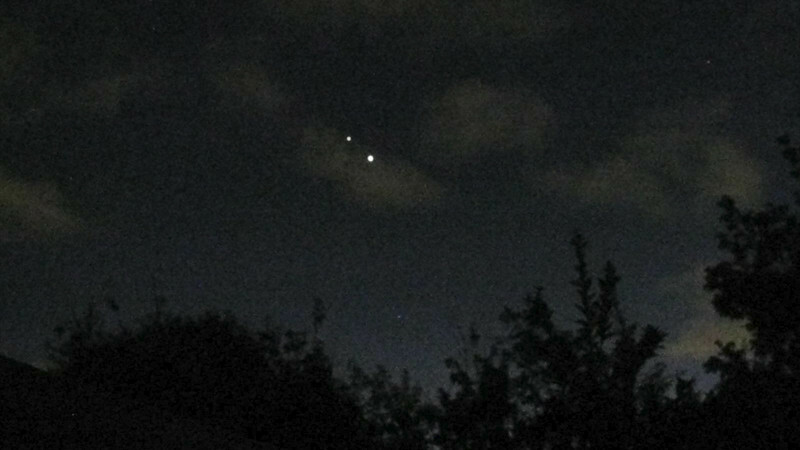 Venus and Jupiter are engaged in a rare close conjunction, something you don't want to miss. Tonight is the night they will be closest to each other—about a third of a degree apart—less than the width of the full moon! Venus is the brighter one, Jupiter the more distant, though still stunningly bright, partner in this dance. To find them, you need only look west after sunset—assuming there are clear skies and an unobstructed horizon. Even in the glow of twilight, each of these planets is bright enough to be seen, and together more so. Planetary conjunctions are not particularly rare. Get-togethers by any two of the visible planets occur periodically as the planets go through their orbital cycles. What is rare in this conjunction is how close Jupiter and Venus will get—as well as the fact that these two are the brightest planets in Earth's skies. The spectacle will be, well, spectacular to the casual gazer—no telescopes required! But, if you happen to have a pair of binoculars, or better still, a small telescope, it only gets better. A small telescope can reveal some breathtaking details of these two planets. Jupiter's four large Galilean moons can be seen in a line across Jupiter's disk—and if the telescope is powerful enough, you might glimpse some of Jupiter's cloud belts, or its famous Great Red Spot. Venus, being closer to the sun than the Earth, goes through a cycle of phases like our Moon, and is currently in a crescent phase. Try seeing Jupiter's moons and Venus' crescent in a single telescope view at any other time—you can't! Venus and Jupiter will set around 11 p.m. PDT—sooner if your western horizon is obstructed by trees or buildings.